Metra’s 2016 Capital program is funded through Federal Formula/State of Good Repair funds ($156.6 million). Other sources of funds that supplement Metra’s capital program include federal CMAQ (Congestion Mitigation and Air Quality) funding ($8.8 million), and ICE funds ($4.7 million). The plan also calls for the continuation of Metra’s Capital Farebox Fund ($15.6 million). Metra’s 2016-2020 capital program tables begin on page 32 and project descriptions for Metra’s 2016-2020 program are included in the Appendix of this document (pages 34-39). Funding available from current sources is shown on page 33. The absence of a fully authorized state capital program, delays in the renewal of a long-term federal transportation funding, and the RTA not issuing bonds in 2016 have limited the available capital dollars available for Metra to maintain infrastructure and rolling stock. The result is a continued reliance on Metra “self-help” and other local funds to support its capital funding needs and a growing backlog of capital projects. While it doesn't explicitly say that using fare revenue for capital is temporary, that inference can be made. Though you indicated in the discussion on service dogs that you don't like that word. Any subsequent budgets will have to be approved by the board anyway, so we'll just have to wait and see what the Metra board and state government eventually end up doing. I doubt Metra wants any more bad press like they had a few years ago when they were taking money away from capital to cover the operating deficit, but I don't envision state funding coming anytime soon either. By finding budget efficiencies, making management improvements and being responsible with our finances in 2015, we have determined that we can get by with a 2 percent net increase in fare revenue – $6.5 million – to pay for the new operating costs of PTC and to help fund a bare-bones capital budget. While it doesn't explicitly say that using fare revenue for capital is temporary, that inference can be made. Nope. A capital budget passed on June 30, 2016 and was signed by the governor. So your logic is flawed. "The plan also calls for the continuation of Metra’s Capital Farebox Fund ($15.6 million)" is enough to say that farebox money is going to capital, regardless of ambiguous statements about PTC. Whether PTC involves operating costs is neither here nor there, but since you are insisting on it, what operating costs are there? That's not what I meant. The "ideal" situation is for the farebox revenue to go toward operating costs and state/federal grants to cover capital. Metra is going to have large capital needs for the next several years, but with the current political climate it's too hard to predict how much state funding they can expect. The practice of using farebox revenue for capital is only being done because they have no other way to get that money. Hypothetically, if state funding could cover the entire capital program a few years from now, I bet this practice would end. I mentioned above how there was an operating shortfall a few years ago, so they diverted capital money to cover it. After a fare increase they were making enough for operating costs again, so they stopped diverting capital money. I used the word "temporary", because they do not want to use money for something it is not intended for. The example from a few years ago sets a precedent for that. I won't speculate on how long the current situation will last, though. what operating costs are there? Metra made that statement, so why don't you ask them? The practice of using farebox revenue for capital is only being done because they have no other way to get that money. Yes, but CTA has been doing it for decades, so it must be a consistent issue, not this state capital budget or another. Similarly, the state did not give Pace $100 million for things listed under the Pace Construction topic, but gave Pace bonding power, to be paid out of the farebox. Metra got its bonding power 10 years ago, and then question then was why they didn't use it and how they were going to pay off the bonds. Those questions essentially got answered 2 years ago. The whole thing is a pyramid of debt--the state sells bonds and then uses the proceeds to subsidize RTA bonds. Similarly, the direct state aid for the Red Line project, Pace CNG buses and South Campus, and the 160 Metra Electric cars and a couple of Metra stations is all bond money borrowed by the state, covered by the pop tax and video poker, among other things. Finally, the transit TIF, discussed elsewhere, also was not state aid,but the state authorizing a means by which to raise it, theoretically. As I indicated, I was not interested in the ambiguity. Nonetheless, it is coming out of the farebox, however categorized. But only available between the named stations indicated on the ticket, unlike Metra whoes ten-ride and monthly tickets are available on any route. Lake Bluff is the latest casualty of ticket office closings. Metra has released a survey about potential changes to the fare system, available until March 31. I personally like the idea of the one day pass. On that one, it depends on what multiplier they are using. Since they are saying "similar to a Monthly Pass" a monthly pass normally costs about 28 times a one way fare, and is assumed to provide 44 rides (or about a 64% ratio). However, if you use it on two lines in the same zone (such as Lisle/CUS/Deerfield) you get 88 rides. Also, if they stick to paper, they'll have to find a way to make sure you don't give it to someone else. In the survey, it said a one day pass would cost the same as two one way tickets. The "similar to a monthly pass" reference just means that it has zone limits, as opposed to a weekend pass. Another proposal was a 7-day pass, for the price of 8 one ways. One question asked about replacing 10 ride tickets with 7 day passes. The "hand it to someone else" issue is the same one they already have on weekends. There's no practical way to enforce it. I also wonder whether 1 day passes would be sold on board, which would require conductors to carry an extra ticket book. In the survey, it said a one day pass would cost the same as two one way tickets. But then they are essentially giving away any ride over than 2 However, they do the same thing by saying that a monthly is good on any line except the South Shore between the same zones. There seems to be more upside for Metra, though in getting (assuming E to A) $185 in advance compared to $6.50. The "hand it to someone else" issue is the same one they already have on weekends. There's no practical way to enforce it. Weekends, they are just trying to round up some business to justify running a 6 car train once every two hours or so. Weekdays the trains run pretty much to capacity, so there's less reason to give that big of an incentive. I also wonder whether 1 day passes would be sold on board, which would require conductors to carry an extra ticket book. I suppose they could have some sort of buy in advance policy, but since they are cutting down on agents, and most suburban stations don't have an agent after 1 p.m., that would be tough. I suppose they could do something like the ME and say you have to buy it from a vending machine. But if they are going to that extent, they should go to a real paperless system using the Ventra card, instead of just the Ventra app (which I don't consider the universal system mandated by a farcical state law, because app doesn't have an NFID method to access the Ventra readers on CTA and Pace). Weekdays the trains run pretty much to capacity, so there's less reason to give that big of an incentive. Daily Herald article on the chairman du jour. What's relevant here is that Metra is at best looking for off peak passengers. The status quo at Metra is jammed rush-hour trains to and from Chicago on weekdays. At off-peak times or for reverse commuters, there are plenty of empty seats. BTW, he has something else wrong. The zone fare system goes back to the 1970s. Before then, each station had its own fare. Maybe in the 1850s it was a nickel to ride to Galena, if the train went that far (indications are it didn't). This got me thinking that most of the effects come down to whether peak pricing is implemented (and I bet it will be). Prices of all ticket types except weekend passes are based on multiplying the one way ticket cost. So what happens if there are two prices for one ways - peak and off peak? If 10 ride tickets are kept, would there need to be a "peak" stamp or punch box? The proposal to replace them with 7 day passes raises a similar issue. If they would be priced the same as 8 one ways, the implication is that the calculation would be based on peak price one ways. The same applies to 1 day passes, priced at 2 one ways. That leaves monthly passes, which currently cost the same as 28.5 one ways. It's hard to say whether peak pricing will change the multiplier, especially considering that any fare structure changes would probably be implemented at the same time as the next annual fare increase in February. We also have to consider who uses each ticket type. 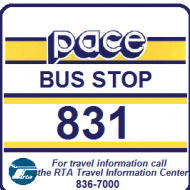 Monthly passes are almost exclusively used by rush hour commuters. Other than the person Busjack knew, people in this group usually make no more than one round trip on most weekdays. Rush hour riders can expect to see their fare go up due to peak pricing. The next group is those who use 10 ride tickets. This group isn't as well defined. 10 rides are used by rush hour commuters who don't take the train more than a few times a week, as well as occasional leisure travelers. If 10 rides were replaced with 7 day passes, most of this group would probably switch to 1 day passes instead. It's almost misleading to use the word "replaced", as 10 rides are useful for occasional riders, but 7 day passes have too much of a time constraint to be considered by that group. For someone who doesn't always ride at the same time of day, 10 rides are less useful if they require paying a surcharge or buying another ticket to travel on a rush hour train. One proposal would make weekend passes valid on Friday nights. I've actually heard several people under the false impression that they already are. I have no doubt that there is demand for this change, especially among college students going home for the weekend. Many workers have the day off or go home earlier on Fridays, so this may also be a way to fill seats. If nothing else, I bet the price of weekend passes will increase. It seems a goal of these proposed changes is to increase nontraditional ridership. That includes off peak travel, transfers between lines, and non-work trips. My conclusion is that the proposed changes do have potential to attract new riders to those markets, especially the 1 and 7 day passes. However, current riders can expect to pay more due to peak pricing and possible elimination of 10 ride tickets. On the vending machine point, I don't see that happening either. Metra doesn't want any more capital projects right now. That's probably the same reason that the list of potential changes has been narrowed to ticket types, rather than more substantial changes to zone structure or collection methods. Rush hour riders can expect to see their fare go up due to peak pricing. Which leads to the addition that they said reverse commute trains are not full, but Metra is certainly serving reverse markets to Lake-Cook, Lisle and Naperville. It seems a goal of these proposed changes is to increase nontraditional ridership. Obviously, it isn't to encourage rush hour, but your earlier questions about peak pricing raise whether the intent is to raise peak fares or lower off peak ones.Given it is a spoke system, the Loop is not the attraction it once was,although I suppose if the point of the trip is to get the kids to the Art Institute, one would leave after 9:30 and go home by 3:00. However, the basic fly in the ointment is unless you are going to a Loop attraction or the Museum of Science and Industry, you still need to transfer to CTA. On the vending machine point, I don't see that happening either. Metra doesn't want any more capital projects right now. But that probably also depends on if they can find a method like CTA did to unload fare collection responsibility on Cubic or some other company (which was the originally stated intent). As I indicated above, I don't think that the Ventra app is the ultimate solution, although Metra should say something about the percentage of paper tickets eliminated by its use. Metra is polling for new fare options and structures that will benefit..greatly the riders... please take this metra fare survey as soon as possible. A proposed new schedule seeks to address changing ridership trends on the Metra Electric. Quick over view looks like branches get reduced service more on mainline. Metra said they would not change fares to compete with CTA. The reason cited was that it would be unfair to riders of other lines. The main change is that Hyde Park gets a train to downtown every 20 minutes, instead of the current setup to facilitate transfers between main line and branch trains. The main thing I noticed is that off peak, while Blue Island branch is still every 2 hours, it becomes (inbound) at odd:18 instead of even :18, and now some Kensington locals (600 series) are added in.That gives the every 20 minutes at Hyde Park, but since 107th-63rd are all flag stops, I don't know what is accomplished by running once an hour between 63rd and Kensington (note the statement "improves midday service to hourly from every two hours at stations on the South Side of Chicago between 63rd and Kensington, including the newly rehabilitated 111th St./Pullman Station near the Pullman National Monument"). But I guess Metra has ridership numbers to support that. Other main thing this appears to do is eliminate the need for those boarding at 53rd and 59th going in the nonrush direction to transfer to mainline and Blue Island trains. The extra Kensington locals are probably just to maintain the 20 minute intervals at Hyde Park. They need a place to turn around and change crews if necessary. But I do agree there probably won't be many riders south of there. Maybe a secondary consideration is trying to attract more visitors to Pullman National Monument. As @Pace831 said, they aren't. As it is, Metra said they are already giving the South Chicago Branch a break by putting it in Zone B rather than Zone C, where it belongs (and the mainline from 83rd south is). With Metra saying it needs the fares for capital, it does not have an interest in subsidizing what few in city riders it has (no, it is not giving a fare break to Rvenswood or Edgebrook, either), nor to institute the Gray Line, if that's where you are going next. Other thing I noticed is that on Saturday, service to Hyde Park is evened out to once every half hour and Sunday is evened out a bit, but a half hour and then 1-1/2 hours. Sundays are still 2 hours on the branches. Frankly, I don't see how that much service was cut. This seems finally a rationalization from the system when a 200 had to be immediately after a 300, and a 100 immediately after a 200 (southbound; other way around northbound) to make transfers, which broke down when the 200 trans were cut way back. Of course, the hour when Blue Island trains leave has been swapped. Sun-Times has an analysis of what trains are being cut. Looks like the Blue Island branch loses its rush hour expresses and gets combined with the rush hour Kensington locals. Then the Kensington locals, which now only runs during rush periods, will now run middays, alternating hours with the Blue Island trains. The early morning and late night shuttles on the Blue Island and South Chicago branches will be eliminated. Personally, I'm surprised that they didn't turn the midday main line trains to flag stops, though that would upset a lot of riders. Unless this gets heavily promoted, I don't see how hourly service between 75th and 111th improves ridership there. Interestingly Metra decided to compete with CTA in Hyde Park after CTA bolstered midday service on the 26, which runs along the South Chicago branch. I suppose Hyde Park is ME' s Oak Park. , though that would upset a lot of riders. Considering that those "paying the freight" are south of Kensington, I'm sure that's the case. With those 3 stations, the direct competition is 6, which runs along Stony Island, a block east. 26 bypasses the 3 stations by being on LSD until 67th. The frame of reference is that 6 runs every 10 to 12 minutes weekday middays, while the ME would run every 20. It also does Sunday, even though the ME will run only (at 57th NB) at :20 and :50 on even hours. On Saturday, ME would offer service every half hour, while 6 runs every 9-10 minutes. Hence, while Metra may be a bit more competitive on weekdays, it certainly won't be on the weekend. On the South Chicago point, it reinforces my point that the "Gray Line" would not be successful unless all express buses were cut off at 67th, which was not going to happen.